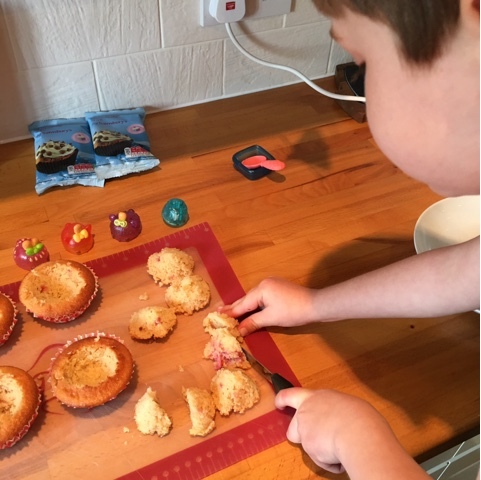 Forget The Great British Bake-Off #gbbo, there's a new baking sensation in town! 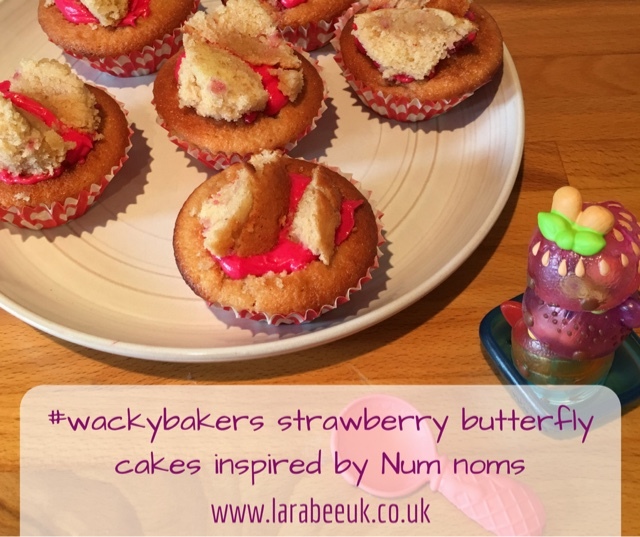 The #wackybakers campaign have challenged us to create a recipe inspired by the flavours in the new series 2 range of Num Noms. 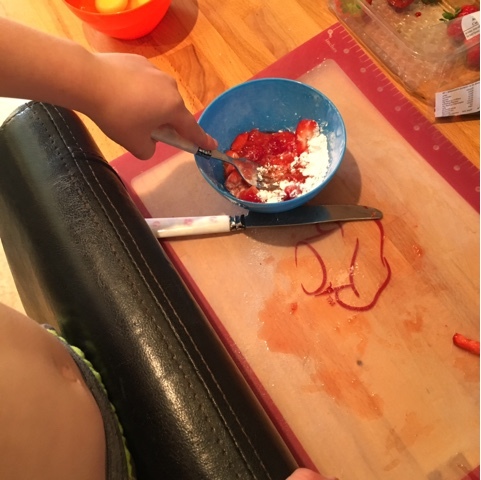 So T has been let loose in the kitchen to create his very own recipe! 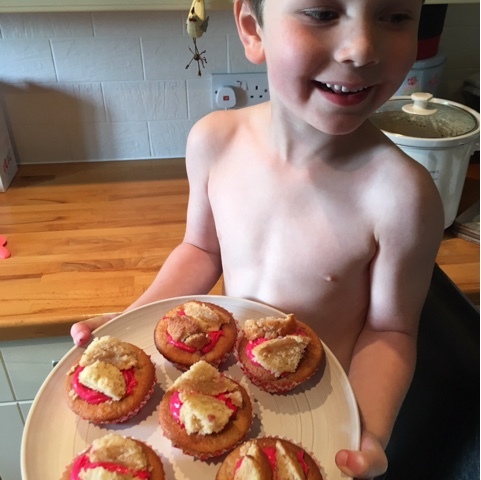 T decided that he wanted to use strawberries in his baking and so I suggested making strawberry butterfly cakes. 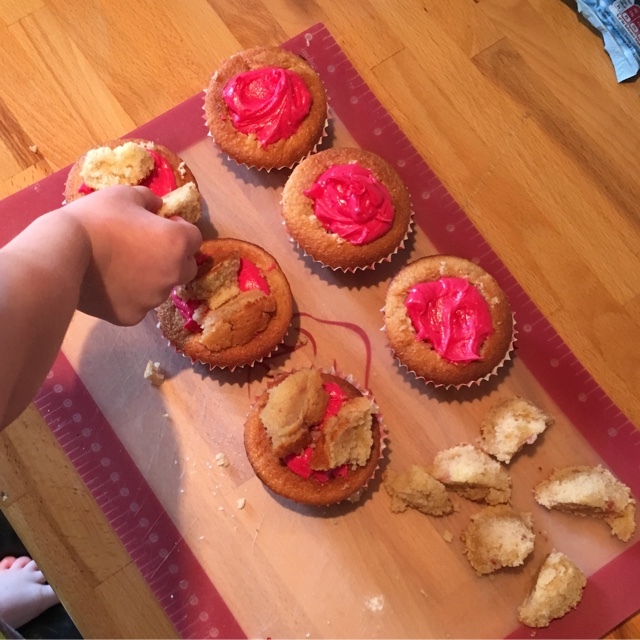 We made 6 muffin sized cakes but you could make 12 regular cakes instead. 1. 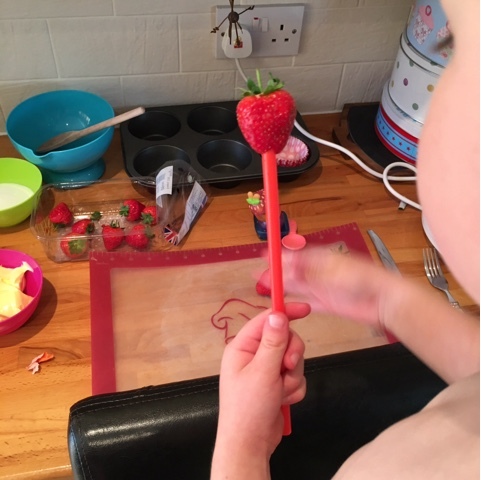 We started off by hulling our strawberries. The best way we've found to do this is using the straw method, try it, it really works well. 2. 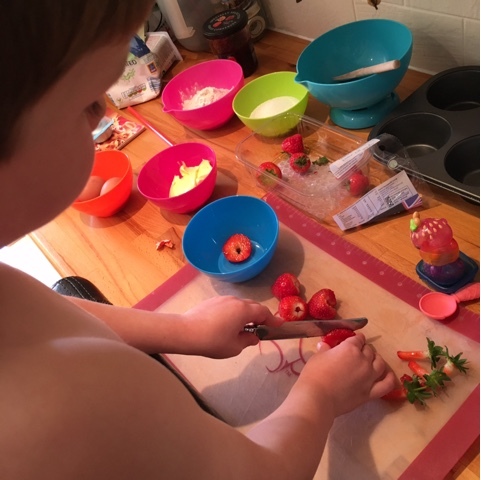 Chop up the strawberries. 3. Add 1 tsp icing sugar and crush with a fork, set aside. 4. Cream together the butter and sugar until light and creamy. 5. Add the beaten eggs. 7. 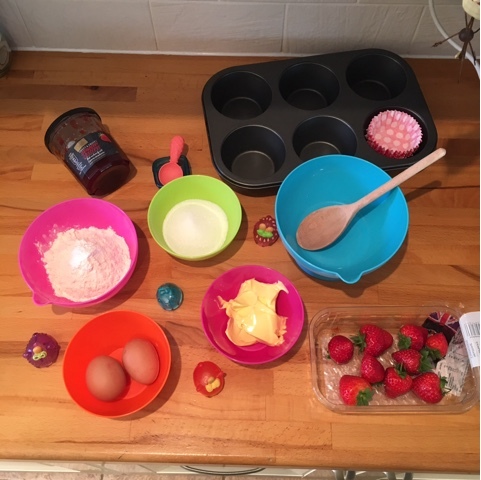 Mix in the strawberries, pour into your cake cases and bake for 18 minutes at 180oC. 8. I cut the tops out of the cakes and T cut them in half to make wings. 9. 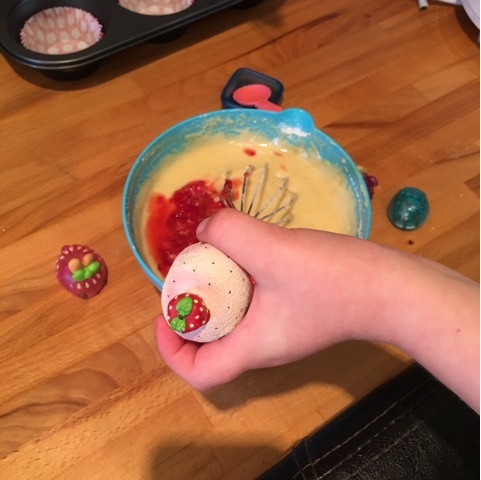 Mix the butter, food colouring and icing sugar together for, the icing. 10. Add half a teaspoon into the hole on top of the cake, then top with icing. Baking in just your pants (fresh on btw!) 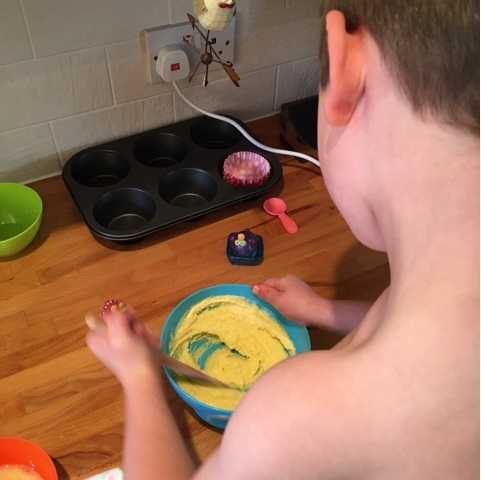 is not mandatory, T just prefers the Naked Chef look! I hope that you like our Num Noms inspired recipe, let us know if you give it a try 😉. What flavour would you choose? Click here to see them all! Disclaimer: we were sent a pack of Num Noms for inspiration for our recipe. Ha ha! T the naked chef, he makes me laugh. Those cakes look delicious! Yum yum!! !